During the Renaissance in Venice, composers such as the Gabrieli and Moneverdi created some of their greatest masterpieces for performance in the great churches on festive occasions. But what would the music have sounded like, given its complexity and the long reverberation times of the large churches? 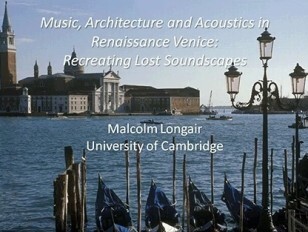 These issues have been addressed in an interdisciplinary project involving musicologists, architectural historians, acousticians and physicists. Using the most up-to-date technology, virtual acoustic models have been created for four of the great Venetian churches, including the Basillica of San Marco. The music composed for these churches can then be simulated as it would have been heard on the great festive occasions. Many animations and simulations will be demonstrated showing how modern techniques can address issues in musicological and architectural history.